Chantilly in northern France isn’t the most appropriate place for an ivory dinner jacket, even in summertime. The French Riviera is a more traditional place to wear the ivory dinner jacket in France. This scene takes place in late June, not long after the Royal Ascot, which means the sunset is very late. At the summer solstice, the sun sets at 9:59 pm, meaning there is plenty of daylight at 6 pm when this event starts. 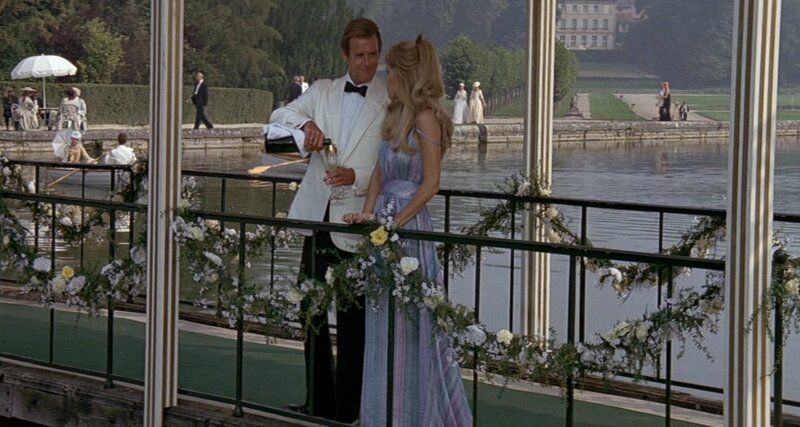 Bond is not wearing his dinner jacket in the afternoon, though it was likely filmed then. The untraditional setting is accompanied by two untraditional elements of James Bond’s ivory silk dinner jacket, made by Douglas Hayward. The most noticeable of these elements is the notch lapels, as opposed to the more traditional shawl collar or peak lapels on a dinner jacket. The lapels here differ in shape from Douglas Hayward’s signature notch lapels, which are cut straight across the top. The lapels have a concave curves along the top and a steeper gorge. The other untraditional part of this dinner jacket is beige horn buttons, as opposed to ordinary mother of pearl buttons or cloth-covered buttons. But since this dinner jacket is made of silk, the horn buttons and notch lapels make it possibly for this dinner jacket to double as a sports coat. Otherwise, this is primarily an ivory dinner jacket, with its button one front and jetted pockets. It also has four-button cuffs—as opposed to the usual three buttons that Douglas Hayward uses—and double vents. The shoulders are soft on the natural shoulder line and have roped sleeve heads. The cut is slightly draped with a nipped waist. The extra drape on this jacket that usually isn’t present on Hayward jackets is probably because silk doesn’t have as much give as wool has and thus needs extra room for movement. The Douglas Hayward straight-leg trousers are black with a satin stripe down each leg, and the black thistle-shaped bow tie is in matching satin silk. Bond’s white cotton voile dress shirt made by Frank Foster has a spread collar, double cuffs, a pleated front with five pleats on each side of the placket and mother of pearl buttons down the placket. Bond’s shoes are black patent leather slip-ons with a cap-toe and a black grosgrain strap over the vamp. The shoes are likely to be from Salvatore Ferragamo. 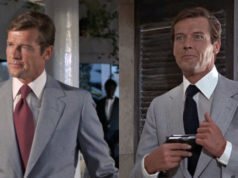 Bond also briefly wears a pair of round translucent brown tortoise shell sunglasses with a keyhole, which have the ability to see through tinted glass). Does anyone know the origin of these sunglasses? Though Bond is undercover as James St. John Smythe, this is certainly an outfit equally as appropriate for the Bond character. The context is a little unusual alright (although high Summer close to Paris can be quite warm). It begs the question; why wouldn’t Moore’s Bond have not opted for the white/ivory version of this outfit for Dinner with Kristatos on Corfu or for his meeting in the Mojave Club in Egypt? I guess the producers tailored their Bond to Moore’s image and his Bond was particularly fond of sporting a dinner suit and to that end they needed to vary things. He’d already worn a dark one for his dinner on the Eiffel tower earlier in this movie and so some variation was called for. What material do you think this particular jacket is made from? Jenny Flex does say the reception begins at 6, and although it is still light out as it is summer, I believe black tie is the appropriate choice here. As for the white dinner jacket, that's still up for discussion. No pocket square and the bow tie appears to be pre-tied. Or wait, I can't remember this scene, wasn't he pretending to be a waiter? That would make sense. Waiters don’t wear silk dinner jackets with voile shirts. The bow tie is certainly not pre-tied. So it is after six, after all. It's June, so that's would explain why it's so light outside. But I'm sure it was filmed earlier than 6 because it's awfully sunny out in some of the shots. But that's certainly a real bow tie. Sunset in Chantilly in June would be just shy of 10pm, so assuming a 6pm reception the light levels seem OK to me. Mind you, seeing a black tie party in the still fairly bright light in an early summer evening never seems odd to me; I live in Southern England, so the hours of sunrise and sunset are similarly extended in summertime. They have the same kind of feel as the Persol 714, but these are much rounder (practically circular lenses). The PO3002 look about right, even has the strip across the top of the frames. Also regarding the outfit remember he is under cover as St John-Smyth. This may explain the ostentatious ring and shades. Who manufactured those sunglasses has bugged me for 26 years. The strip on the PO3002 is from a clip-on and the nose bridge is set lower than Bonds which also sport an integrated strip across the frames. One guess could be that they're vintage Persols, but I've never seen anything like them. what of the OHM markings on the lenses: any hint on the brand or model? Most likely they are not Persol frames as they are missing the identifying Meflecto hinge. The lenses are most definitely perfect rounds and the bridge is made of a lighter colour acetate, which as Victor says does not look like the PO3002 clip-on. Other identifying characteristics is the chunky, notched key-hole bridge and protruding endpieces. 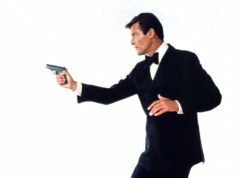 OHM is only assumed to mean On Her Majesty (secret service). One would think an eyeglass brandname would not be present on the lens unless on purpose at this time. Still looking for the brand & model info! Just an idea on the context of the outfit, Bond is under cover as James St. John-Smythe. He is posing as a very wealthy man who either is into horses or just inherited some and is looking to start breeding, I can’t remember exactly but either way he’s there to purchase horses for thousands if not millions of pounds. This persona calls for a bit of flamboyance perhaps even faux luxury, note at this same party is a Texas oilman and Zorin himself is in technology neither are traditionally aristocratic sources of wealth. So Bonds cover fits the other guests and in theory he should not stand out. This cover would explain the untraditional or unrefined decisions made by Bond in this scene. I too am unable to figure out the maker of these sunglasses and it is maddeningly annoying. Just because they are missing the Meflecto hinge or the silver arrow does not mean they are not Persols. I have seen some without those elements, however I don’t believe the glasses are Persols. I have come up with a theory though that they were not made by a dedicated sunglasses company like Persol, perhaps they were made by a label that does not solely produce sunglasses e.g. Hermes or Yves Saint Laurent. I do not know much about vintage sunglasses by such labels and maybe there are distinct marks missing or present on the glasses which would debunk my theory but its just an idea.